This strain produces thickly fleshed fruit bodies with a grey-brown cap of 4 till 6 cm and a long white stem. The king oyster’s short gills and thick flesh, coupled with its nice flavour attracts this species to the consumer. PE has an excellent taste and texture as well as a long shelf life. The key to a high production and good quality fruit bodies is the substrate. The main components of the substrate that various growers use are: sawdust, wood bits, cottonseed hulls, wheat bran, cane sugar, calcium carbonate ect. Soft structured sawdust is most used. 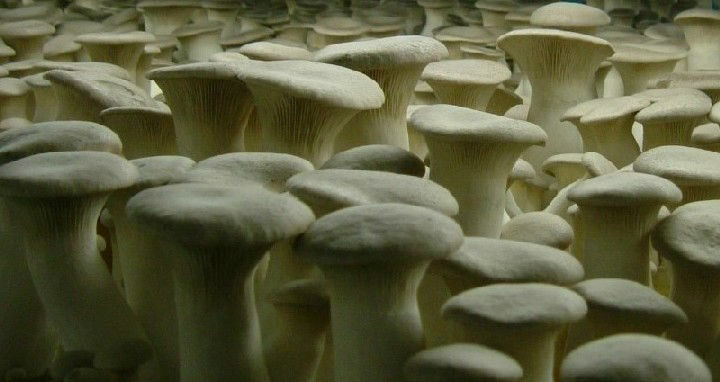 It is easier for the mycelium to decompose it, and soft structured sawdust has a higher yield. Sawdust can be from various trees like oak and beech. The mixed structure of particles or 2-4 millimetre and powder also has a more positive effect. The substrate materials should be evenly mixed; water should be evenly distributed and absorbed. Herewith the nutrition is evenly spread, and the mycelium grows uniform. After bagging, you can make a hole of 5-6 cm deep and 1.5-2 cm wide in the middle part of the substrate for later spawning. To sterilize under pressure, the temperature should be up to 121°C for 8 hours. Or when you want to pasteurize the temperature should be at least one time 100 oC for 10 to 24 hours. Either way the most important thing is to keep the time between filling the bags and sterilizing as short as possible! Recommended spawning-rate is 1,5 till 2 % of the wet substrate-weight. The spawning procedure must be done under very hygienic conditions. Optimally is to do it in a filtered over-pressure cabin, where the bags are opened for a very short moment for spawning. After spawning the best temperature for PE is 23-27°C. The optimum pH levels at spawning are between 6.0 till 7.5. The optimal moisture content depends on the mixture but averages at about 64%. After spawning the best temperature for PE is 23- 27°C in the substrate and the best humidity is 90%-95%. When the indoor temperature is 25°C, frequently ventilate about 1 air exchange per hour. But when the room temperature is below 20°C, than reduce the ventilation times. Keep the CO2 level in the room at about 5000 ppm. The mycelium is whitish, longitudinally radial at first. If no filter in the bag is used then the mycelium grows to one third high of the plastic bag, the growing speed will slow down. Then you pierce holes to give more oxygen to the mycelium in the substrate. After doing that the mycelium will become cottony, clearly grow thicker and faster. After 4 weeks the mycelium is fully grown into the bag. First bring down the air temperature to 15oC . From this moment on the light requirements are between 850 and 1500 lux. After two weeks the pins will be visible and the bags can be opened. When opening the bags fold down or cut off one third of the bag. The humidity of the room should be about 90% and the CO2 -level should go gradually down from 2000 ppm to 700 ppm or less when there is pin setting. Reducing the CO2 level causes less misshapes. When the first pins are about 2 cm long, than the relative humidity should gradually be lowered from 90% down to 88% and later to 85%. Keep the CO2 level at about 1000 ppm. The best is to not spray water directly on the fruit bodies at pin growing this causes water spots or even bacterial blotch. Take special care with ventilation at the stage of pin growing for having evaporation from the fruit bodies but no drying. When the fruit bodies are big enough and before they have some spore powder on them, it is time for harvesting. At first you cut by knife the bigger fruit bodies out of the cluster and leave the rest of the stem on the block. Later in the1 flush you can s twist the clusters from the block and promptly clean up the root remains and old fungus. The relative humidity should be around 85 %. Stop watering for 5-7 days. After cleaning the substrate do spray water on it and wait for 10 to 14 days for the second flush at high humidity. The yield of the first flush will be 60%-70% of the total. The quality and size of the fruit bodies of the second flush is not as good as from the first flush. The total yield of PE can be 25 % of the wet substrate weight or even higher.